On Palm Sunday, the church commemorates the triumphant entry into Jerusalem of a would be king who would ultimately be killed for daring to say he was the son of god. Most years, on Palm Sunday, I go to church, pick up my palm leaf and wave it along with the crowd. Most years, on Palm Sunday, I reflect on how we, the masses, mislabel our leaders and then crucify them when they prove to be something/someone beyond our capacity to imagine or accept. And still, knowing what we will do, the man, the king, the god, walks into Jerusalem. This year, Palm Sunday fell on the 29th March. This year, I wasn’t at church. I was out there with the crowds, holding onto a small red and white flag with 5 stars and a crescent. Lee Kuan Yew, the founder of my tiny country, the little red dot in the middle of South East Asia, had died on the Monday. And so, this Palm Sunday, the day of his funeral, I was out there with the masses who lined the streets in a pouring thunderstorm to say goodbye. As I walked among the crowd, handing out water, tissue paper, and umbrellas, I reflected on how we, the masses, had never really understood this particular leader’s labour. I looked around me at the city that rose from his vision. It was an achievement difficult to comprehend. It was an act of nation building many in the West, who value free speech and individual rights, find difficult to accept and applaud. But the masses I had walked among had no such compunction. 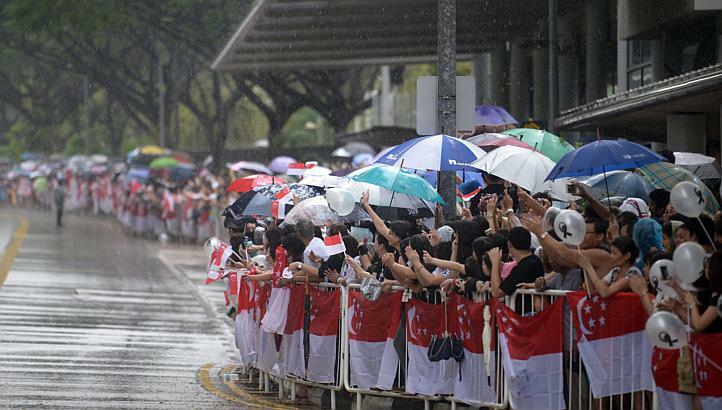 They stood in line in the rain, they waved their flags, and as the cortege passed, they shouted his name. This was not a god going to an early predestined death but a man being sent on his way, the way of all flesh. It was a farewell the man might not have imagined. BUt it was one I believe he who would have accepted with good grace. This is the week after, the day before Good Friday. I contemplate another death, a rising. And in this week after, I contemplate another step for my country too. ← For Lent I’m giving up words! I too missed Palm Sunday. This time of year is always very thought-provoking for those of us brought up with the Christian religious calendar and its featss and solemnities. Here as we face an election I am captivated by your phrase, ‘And still, knowing what we will do, the man, the king, the god, walks into Jerusalem.’ I keep hoping that my faith in a party that should care is not misplaced and that its leader will ultimately justify our faith. But I think we always expect too much of people who are, after all, just humans. Good to read from you again.